Saima has built a very extensive record in educating the public on the need for, peace, justice and development work in various international conflicts after she took over as a Program Manager of the Consortium for Peace Studies (CPS) at the University of Calgary (2010-2013). Through her work at the Consortium for Peace Studies and later through her work in the 2020 Vision for Humanity and many other organizations, she high-lighted to the world ways to reduce the human and environmental cost of conflict in a wide range of global and local issues. Saima worked diligently to educate our community to promote peace. Here are some of the highlights of her work in these organizations on the field of international conflicts. 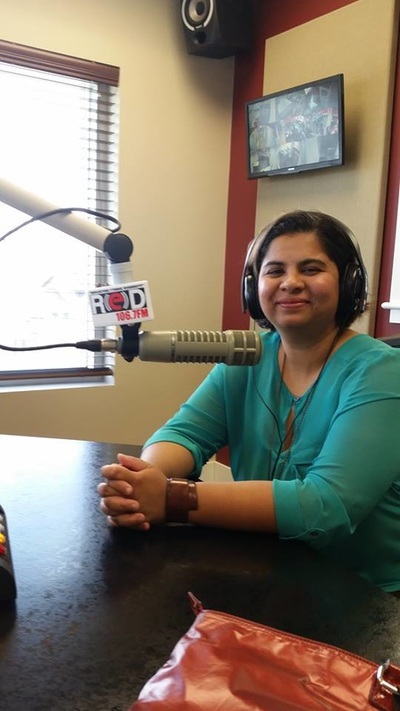 Saima Jamal joined Calgary's Nepalese, Punjabi and other communities in an all day radiothon raising money for Nepal earthquake victims on May 1. Almost 325,000 CAD raised - thanks to Red FM's radiothon! Later on she joined the Nepalese community for a massive candlelight vigil in City Hall. 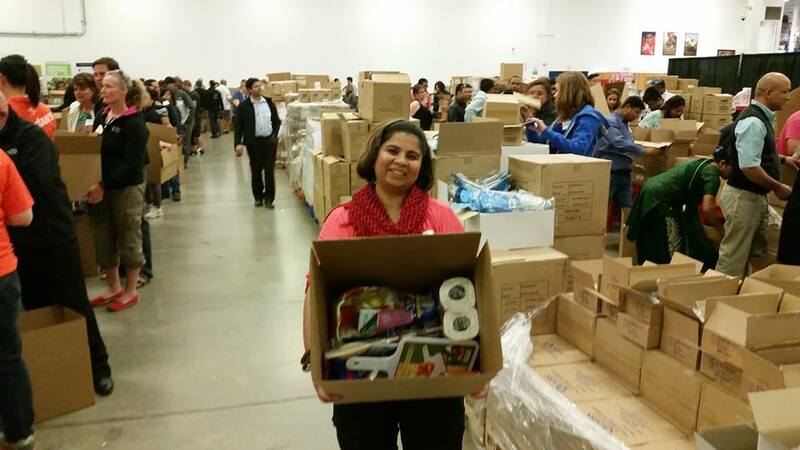 This fundraiser was followed by assembling care packages for Nepal – thanks to Samaritan’s Purse for organizing this! Calgarians have a big heart! This is true humanity, true Canadian! Saima actively participates every year in Calgary's Orphan Sponsorship Program. On Feb 7, 2015 the organization gathered in Magnolia banquet hall to fight children‘s hunger and sponsor 300 orphans around the world - one orphan per guest. This ambitious goal was achieved whereby 100s and thought of dollars were raised for orphans in Syria, Palestine, Iraq, Lebanon, India, Pakistan, Afghanistan, Bangladesh, Chechnya and many more countries. Saima Jamal help round up the Calgary community to fill up the 40 ft trailer taking warm clothes & blankets to Syrian refugees in snow covered Lebanon. This trailer filled up in 2 days with Calgary's generosity! So a second trailer was brought, filled and shipped off! 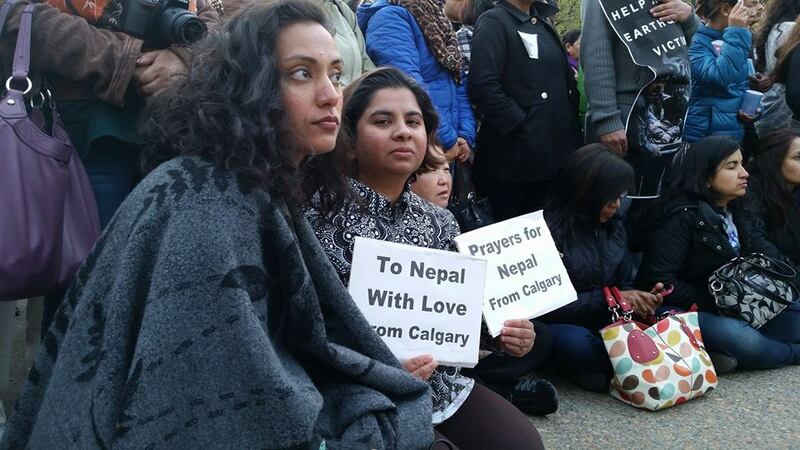 Saima also worked in getting donations for the cost of $5000 to ship each trailer from Calgary to Lebanon. Saima Jamal believes that the representation of different perspectives on conflicts in the Israel Palestine issue are key to promoting dialogue and understanding amongst these two fractured groups, with the hopes that it may eventually lead to peaceful resolutions to the benefit of all stakeholders. Lasting peace can only happen if both sides make a serious commitment towards dialogue, recognize the Palestinian people's right to self-determination, lift the blockade of Gaza, provide humanitarian aid after the tremendous destruction of Gaza, hold those accountable to the international communities war crime tribunals and end Hamas rocket attacks. Saima helped host a variety of discussion forums at the University of Calgary as Program Manager of Consortium for Peace Studies and elsewhere in the capacity of social activist. 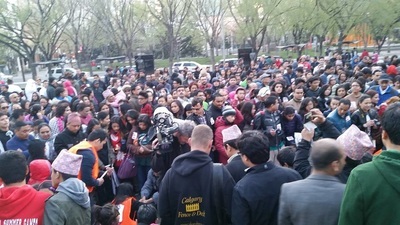 2014: Hosted 5 Gaza Peace Rallies in Calgary City Hall in support of a lasting ceasefire featuring MLA David Swann, MLA Darshan Kang, Dr Arthur Clark, Brian Seaman, Chantal Chagnon Greyeyes, Michael Gretton, Gurinder Singh, Peggy Askin, Ala'a Hamdan, Tim Nethercott, Ronnie Leah Joy, Miriam Meir, Amna Qureshi, Michelle Robinson and Adam Idris. These events transformed Calgary from an apathetic city to an activist city that passionately called for end to the scourge of war. 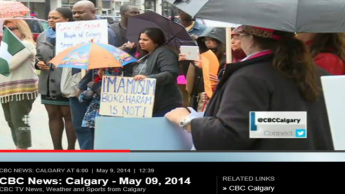 2014 ISIS in Iraq and Syria: Saima gathered with all her friends and family 4 times in Calgary City Hall in 2014 to denounce the dangerous deviant group ISIS as well as condemn violent extremism that is underscoring Canadian Muslims’ commitment to the safety and security of Canada and look into ways to stop the radicalization of Calgary youth from joining conflicts in the middle east. ISIS has manifested some of the worst and barbaric human behaviour by mercilessly and brutally killing innocent people, looting, robbing, kidnapping and enslaving hundreds of Muslim and non-Muslim women and children and committing all kinds of atrocities against religious minorities. They have displaced entire populations, executed journalists and those who refuse to join their extremist ideology. They claim to establish a so-called “Islamic caliphate” but their abomination does exactly the opposite of what Islam calls upon believers to do, namely establish peace and justice and safeguard human rights. We categorically condemn the actions of this group and its monstrous crimes against humanity, absolutely and without equivocation. We emphasize that Canadian Muslim communities live peacefully and respectfully with people from different faiths and beliefs, as well as various ethnicities across Canada. They wholeheartedly understand and believe that it is a religious and a civic duty to promote and support peaceful coexistence and multiculturalism and to condemn bigotry, hate and discrimination against any group, here and everywhere: that is essential to being both Muslim and Canadian. 2014 Boko Haram in Nigeria On a cloudy rainy weather, we came alive in 17Ave, Tomkins Park to scream out so loud that even Boko Haram heard it all the way in Nigeria: Bring Back our Girls! Lots of energy even in the bad weather which showed Calgarians really cared about this issue. We rallied to put pressure on the Nigerian government to do more in bringing back these kidnapped young girls and for our government to play a positive role in making sure the Nigerian government is doing everything it can to rectify this situation. 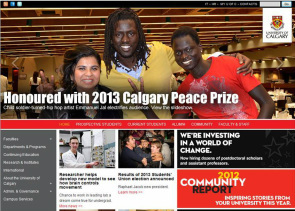 2013 South Sudan: Hosted child soldier turned music rock star Emmanuel Jal for the 2013 Calgary Peace Prize. Emmanuel brought light to the brutal civil war of Sudan and the formation of South Sudan. Emmanuel Jal’s commitment to promoting world peace through his music and humanitarian endeavours made him an outstanding nominee. He was recognized for his dedication to encourage human creativity as a powerful means of aiding individuals and communities to prevail over suffering. We commend him for highlighting human suffering of war ravaged countries and bringing inspiring messages to promote peace for the creation of a positive global community. 2013 Syria: International Law Enemy of the good: Saima Jamal connected the Muslim Council of Calgary with Calgary Centre for Global Community and Project Ploughshares Calgary to bring an event at the Akram Jomaa Islamic Centre that discussed the current Syria crisis along with different ways of non-militaristic interventions. 2012 Could we Intervene in Syria? Should We? The wanton killing of innocents anywhere provokes our moral indignation and prompts us to employ our military strength in their defense. After all, if there is no peace to keep, should we not at least engage in peacemaking – first and foremost by preventing a further escalation of political violence? Would this not be a fitting expression of our professed values and ideals? But in such situations, our moral certainty must confront terribly vexed problems which rarely yield simple answers shorn of risk, uncertainty and further moral quandaries. Saima (CPS) organized a lecture presented by Dr Jim Whitman, Senior Lecturer in the Department of Peace Studies, University of Bradford, UK to discuss these contentious issues. 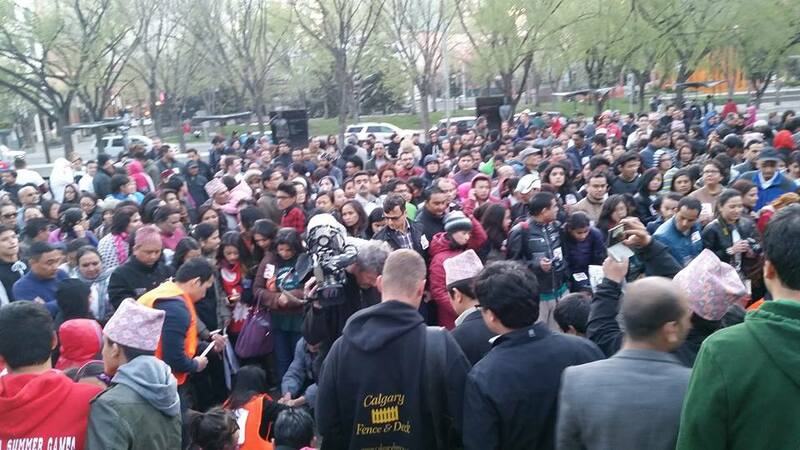 2012 "Realities and Layers of Conflict within Current Colombian Society": Saima (CPS) organized this event that featured, a Colombian Mennonite leader in peace-building and community transformation. A lawyer by profession, he has decades of experience working with local churches and community organizations in regions of Colombia deeply affected by the armed conflict and land disputes. Ricardo discussed in depth the roots (history and politics) of Colombia’s current conflict and the peace process that is shaping up now. 2012 Iran Israel Nuclear problem: The spectre of political and military instability continues to loom large in the Middle East. The Huffington Post reported speculation that Israel's government was “giving serious consideration to an attack on Iran's nuclear facilities in the coming months, an action that would trigger a cascade of unpredictable military, political and economic reactions in the region and around the world.” Saima (CPS) co-hosted a public panel discussion on this topic, where academics and peace activists tackle the different facets of this issue. The aim was to raise awareness about the underlying factors behind war and to encourage education in principled negotiation to resolve conflicts. Panelists include: Dr. Arthur Clark, professor of in the Department of Pathology and Laboratory Medicine and Department of Clinical Neurosciences, University of Calgary and founding member of the Consortium for Peace Studies and the Calgary Centre for Global Community. Dr Clark talked about engaging civil society towards a positive non-violent outcome in this process. James Keeley, associate professor, Centre for Military and Strategic Studies, University of Calgary. He covered issues surrounding the Iranian nuclear program and the IAEA and negotiations over enrichment. Jorg Ostrowski, environmental architecture graduate and peace/justice activist. He stated his position grounded on facts from inside and outside of Iran as well as talked about the Silk Road in Persia, building bridges, a proposal for recycling the old Silk Road and transforming it into a new International Peace Bridge and Road to Peace in the Middle East. Shahab Moeini, natural resources & securities specialist of Iranian origin who has extensive work experience with international organizations in Africa, Asia and Middle East. He did a compare and contrast of the 2 countries and voiced the opinion of the Iranian public. 2011 Dictatorship and Democracy: Causes and consequenses in the Arab Spring: Saima (CPS) partnered with the Calgary Public Library to present an interactive session on the recent developments in the Middle East called “Dictatorship and Democracy: Causes and Consequences in the Arab Spring” . The discussions were informative, very passionate & timely. Panelist included Dr Tareq Ismael, middle expert for the U of C, Dr Arthur Clark & Bassem Hafez (Political Science doctoral student at the U of C). This was a first townhall in Calgary on this subject. Discussions included historical precedents, human rights, state interventions, and civil society’s obligation. This took place on May 25th , 2011 in the John Dutton Theatre of the Public Library. 2011 Cyprus and Peace Journalism: Hosted Peace Studies Research Fellow Dr Sanem Sahin on Reporting the Peace on an Island in Conflict: the Role of News Media in the Cyprus Problem. This talk was collaborated with SAIT’s Media Studies Dept. The talk covered how the Turkish Cypriot news media represent the Cyprus Problem and the ongoing peace process as well as peace journalism. 2011 Augustine Brannigan – Rwanda Genocide: Saima (CPS) collaborated with the Postcolonial Studies Research Group (supported by the Faculty of Arts) and the Centre for Military and Strategic Studies to host this lecture. Dr Brannigan is a professor of genocide studies at CMSS. He suggested that the 1994 genocide in Rwanda had its roots in pre-colonial, colonial, and neo-colonial patterns of affiliation that created administrative and racial closure, which permitted mobilization of large numbers of perpetrators who murdered without much evidence of compunction or remorse. Audience interest was very high in this subject. 2011 Sierra Leone: Canada’s contributions to nurturing a culture of Peace and Nonviolence in Post-War Sierra Leone: Saima (CPS) hosted at the U of C, Summer institute in peace building's instructor Dr Thomas Turay presented a talk on CD Peace - his organization in Sierra Leone. This talk described the historical connection between Canada and Sierra Leone and increased the understanding of how Canadians are contributing to peacebuilding in Post-war Africa with particular reference to Sierra Leone. The talk developed more interest in global peacebuilding/ development. to take a deepening look at children’s rights and human rights in terms of cultural difference vs universal rights in Iraq. to examine the baggage we carry with us in our international work with other nations, whether with Iraqi or Blackfoot nations, and the transparency and critical self reflection needed for doing this work.